The Fairview is a family run guesthouse, ideal for the budget traveller and for families with children. The World War II bungalow was the residence of a Chinese architect and businessman, Tan Sri Datuk William. It was turned into a guesthouse in 2003, first to keep the house alive, and secondly to generate income for its conservation, part of Kuching’s heritage. Fairview is run by a local family, relatives of the late owner, Eric, Annie and Anson Yap. This friendly Kuching family will do their best to make you feel comfortable, and organize your journey throughout Sarawak. Annie, who grew up in Santubong, in the Hainanese coffee shop (kopitiam) set up by her late father, would be happy to cook your breakfast either occidental or the local style (noodles) with a cup of coffee direct from the coffee pot. If you are keen to try the traditional Sarawak Laksa, you may ask Eric for his favourites places in Kuching. Both Eric and Annie like to chat with their guests and share their tips, addresses and contacts to appreciate Kuching and its surroundings. Because they are avid travellers themselves, they are quite sensitive about budget travellers’ needs and facilities like laundry, transport, luggage storage, pick-up etc. Surrounded by the Reservoir Park, Fairview is set amidst a large tropical garden where Eric and Annie cultivate some fruits and herbs. Families with children are always welcomed and hyperactive children can play in the garden while parents relax with fresh drinks in the living room. The bungalow itself seems to be in time – in the 60s to be precise. All the furniture in the bungalow is in its original form, the home decor is a collection of souvenirs and gifts from all over the world, and the diverse angels and statues of Saints put the final touches to a perfect ‘kitch’ ambiance. But you can rest assured it doesn’t smell mouldy and it’s dust free. Stay there and enjoy Kuching: J Three bedrooms in the bungalow, 2 new bedrooms in the annexe buildings all come with attached bathroom, hot water, aircon and fan, for less than 100 RM / night. The rooms are spotless with wide windows – unlike the backpackers lodges downtown, apparently more cosy and modern, but with no natural light. One dorm with shared bathroom is available for low budget travellers. 🙂 Facilities : kitchen available for cooking, laundry, internet, pick up at airport and transport, bookings reservation. J J Very clean. 😦 The main road nearby can be very noisy early in the morning due to the traffic. 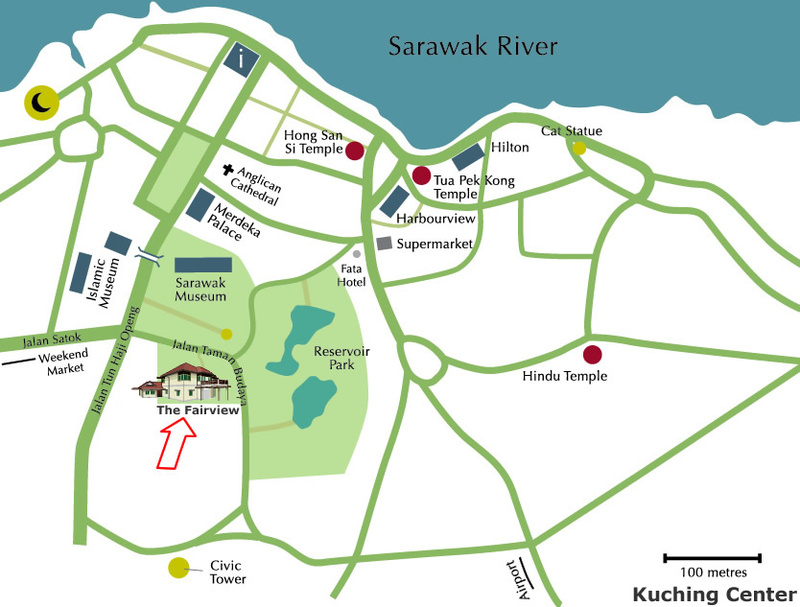 Plan your trips and tours around Kuching and deeper into Sarawak with Eric and Anson : take time to discuss the best places to visit depending on your wishes (nature, indigenous people, culture..), budget and time. Fairview offers some tours and can arrange some others with local specialized tour agencies. A 1/2 day trip to Santubong river to spot the river dolphins. The boat trip was organized by William, an English student who monitors the proboscis monkey colony along the Santubong river banks. By doing this trip with him, you sponsor his research on wild life. We were not lucky that day and did not see any dolphins but it was a very nice boat trip. A 1/2 day trip to Ana Rais Bidayuh Long house: We found the place a little bit sad and very touristic. A 1 night and day at Pulau Satang Besar designated as a turtle sanctuary to protect Green and Leather-back turtles which come ashore to lay their eggs on the beach. This private island is part of the Talang-Satang National Park run by Sarawak Forestry. The 4-5 wood chalets are very basic and can accommodate only small groups (<20 pax). I must confess that it would need serious improvements to make it safe and comfortable: proper toilets and bathroom, get rid of all the unused stuff lying around the place which make it dangerous for children, and mosquitoes nets would be the minimum. One other concern is that the resort relies on rain water which becomes scarce during dry season. Efforts to encourage people to save water should be carried out. The staff seems to do their conservation job properly, protecting the turtles from direct light, digging out the eggs with care. Check their website for the Sarawak Forestry Sea Turtle volunteer programme . Fairview can arrange this trip for you with very good prices and delicious food. 3 days and 2 nights at Mengkak Longhouse, (Nenga Mengkak, Kampung Rumah Burau, Batang Engkari, Sarawak) Batang Ai district. This Iban longhouse, located on the banks of the man-made Batang Ai Lake, welcomes tourist visits mainly during the day. It is possible to stay overnight and share the life of the 37 Iban families living in the longhouse. The tour was organized by Borneo Maryland upon request of Fairview. Our guide, Jagarai, himself a Bidayuh (different indigenous community of Sarawak) spoke Iban language and was apparently very close to the Longhouse inhabitants. The activities generated by tourism (boat drive, cooking, dancing, guiding..) are scheduled by the longhouse community, who decided to open their longhouse to the public 10 years ago to generate extra income and keep families within the village. We stayed there with 5 children from 8 to 12 years old. It would be better if you could speak at least Malay to be able to communicate with the shy villagers. Mengkak Longhouse is about a 4-hour drive and 45 mn boat ride on Batang Ai Lake . Thanks to Burau, the longhouse chief, and Awa his wife, for their warm welcome. You can miss it it’s just across the road back to the Sarawak Museum: just walk through the park with some old Chinese graveyards and a kiosk and cross Taman Budaya road. The Society Atelier, which conducts research and promotes the traditional craft of Sarawak, especially weaving. Now you can even have your lunch in the beautiful bungalow. The Tun Jugah Fondation, Kuching, Sarawak : a must see museum for textile lovers especially for the indigenous ikat weaving of the Iban, called Pua Kumbu. If you have stayed at Fairview you can write a review on Trip Advisor.